TOFU MOM . . . and gravy! : Some Potato Salads of YUM! Some Potato Salads of YUM! We're seeing a good bunch of veggies fresh from Yakima, which is half-way across the state, and has different weather entirely, so they manage to harvest earlier than we do here near the Puget Sound. Close enough for me though, I'm enjoying all the fresh summer produce I can get my hands on!! Here's my newest favorite. I LOVE the fresh veggies! I got sort-of an approximate idea from our local CSA's recipe flyer. Mix well (I use my food processor) and refrigerate. Salad: Cook beans until just done (they should be firm and retain their bright green color). Quarter potatoes. Add potatoes to boiling salted water and cook until done but still firm. Drain and put into large bowl. Add remaining ingredients to bowl (except radishes) and chill. Do not toss until potatoes are well chilled. Cover and chill for several hours or overnight. Pour dressing over salad 2 hours before serving and toss to coat. Before serving or transporting, stir in radishes. And here's my favorite basic, go-to potato salad. Everyone loves this and it's SOO simple!! Cut potatoes into 1 inch chunks. Bring to a boil over medium high heat. Cook until potatoes are tender, about 10 minutes. Drain potatoes. Toss hot potatoes with radishes and onions. Cool to room temperature. Add in the Vegenaise, sour cream, mustard, salt and pepper, stirring gently. When potatoes cool down to room temperature, add in dill. Taste and adjust seasoning. Refrigerate at least 2 hours before serving, garnish with dill and fresh cracked black pepper. Oh I am going to make that fresh market salad! My family will love it. Nothing like a good potato salad! Yours looks awesome. Thanks for sharing!! I've never put radishes in potato salad, but it sounds yummy! I'll try that. 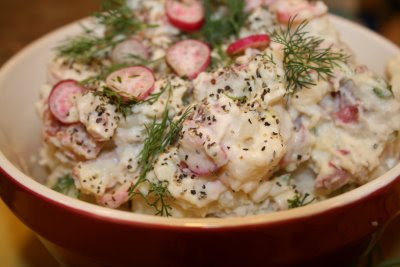 i never thought to put radishes in potato salad – i love it & am totally gonna have to try this! thanks! aren’t fresh veggies the absolute yummiest?!? hooray! Potato salad always makes me think summer! I always love the creamy versions. The addition of dill would be amazing! My sister lives on a farm south of Yakima. When I lived in Ellensburg, I used to enjoy going down and hitting the all the fruit & veggie stands with her. Ahh, good times. I love a good potato salad and both of these are outstanding. 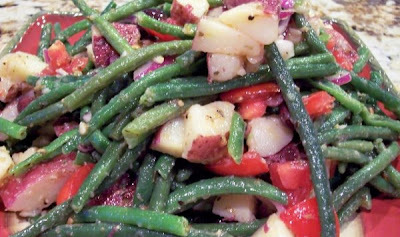 mmmm... string beans in a potato salad. looks wonderful. I'm getting hungry!